In 1993, a competition was launched for a landmark to commemorate the new millennium. There was no specific site and no commitment to build anything, but the designs would be published in the Sunday Times, so we thought it would be great publicity. We didn’t think a tower was right for London. How could you compete with the Eiffel tower? We didn’t even go there. Then one morning it hit me: a wheel is how to get people up high easily, efficiently and effortlessly. I thought it could go in Hyde Park, where the Great Exhibition took place. But my wife and fellow architect Julia said no – the obvious spot was the South Bank, where the Festival of Britain was. We had our idea and our location. But we didn’t win the competition. Nobody did – the judges didn’t think any of the ideas were good enough. We were narked. We had a great idea and no one was going to see it. So we said: “Let’s just do it.” We put in a planning application, but it wasn’t just the council we had to convince. We had to meet with County Hall, the Southbank Centre, the Arts Council, the Port Authority, every organisation in London to do with the river and the environment, plus all 32 boroughs and the City of London! The most negative meeting we had was with the then chairman of the Royal Fine Art Commission, Lord St John of Fawsley. The RFAC was set up to review projects of national significance, so it was an honour to present to them. But when we got there, he continually interrupted us. It was incredibly rude. He thought the Eye was going to ruin London – he said it should go to Cardiff. He thought he was going to kill off our idea. Certainly, for years, nobody thought it would be built. But we didn’t give up. I don’t know if people underestimated us, or we were just stubborn, At one point, we had our house, our whole livelihood on the line. The point of no return happened when the first quarter-rim came up the river and they opened Tower Bridge for it. The whole wheel weighs 600 tonnes and each pod 10. All in all, a couple of thousand tonnes of material came up the Thames. 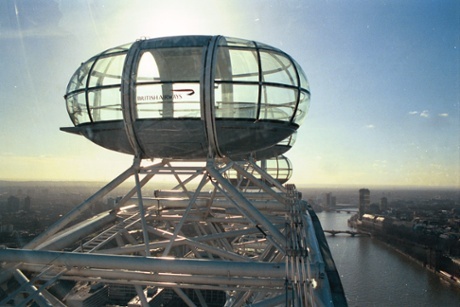 The Eye was meant to be bigger – 500ft high with 60 pods holding 16 people. But we put together a mockup in the French village where the pods are made and dragged it along at different speeds to see how easy it was for people to get in and out – the entire village turned out to help us. The pods were so spacious 25 people could fit inside and we realised that, if you had fewer pods, there’d be more space between them and therefore better views. So we reduced the number to 32. 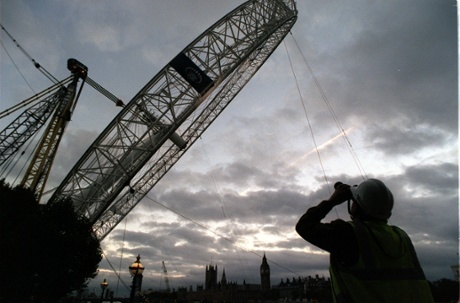 The wheel got shrunk after the project went over budget, but you do see very well at its final height of 443ft. 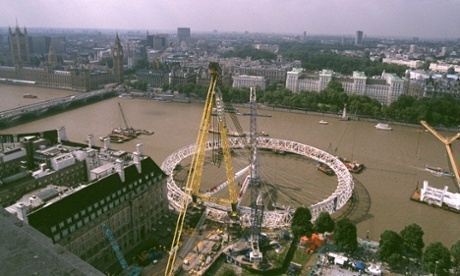 There’s a myth that we had to change the whole foundations of the South Bank for the Eye. Actually, there were already good foundations there, although we did have to stabilise the spot that holds the tension cables. That day, all the cement lorries in London had to turn up at once because it all had to be wet at the same time. We were very unpopular with every building site in the city – we had all the cement in London. For years, there was pressure from the South Bank and from the then mayor Ken Livingstone to up the rent. Everyone was trying to extract as much money as possible. I don’t blame them. The thing we’re most proud of is that, when we renegotiated the long-term plan in 2006, we ensured the Eye contributed 1% of ticket revenues in perpetuity to the local community. The best thing about the Eye is the journey. It’s not like the Eiffel tower, where you get in a dark lift and come out on to a platform at the top. The trip round is as important as the view. Although the Eye’s never come close to closing, it’s not completely permanent. It has a 20-year lease. But it’ll stay open for ever if it’s well looked after – and people still want to go on it.